Maharashtra, India's third largest state, has much to offer to the world. It is home to major cities like Mumbai and Pune, major rivers like Godavari and Krishna, it is a state that has people of immense talent and not to forget, the state has a rich heritage which can be viewed till date in the form of their forts and palaces. Mumbai, the capital city of Maharashtra is also filled with places to visit and things to do. But living in a city for too long makes you want to explore more places. Luckily for Mumbaikars, there is an array of options to choose from! Junnar is one such place that can be ventured into. It has been an important trading and political region, and is located close to the city of Pune. Historically, Junnar was first mentioned by a Russian traveller named Afanasy Nikitin, back in the 1400s. Similar to the weather of Pune, Junnar experiences a tropical climatic condition throughout the year. Tourists travel to Junnar between October to February mostly, since the weather is cool and breezy. Monsoon can be avoided since rainfall is heavy in Junnar. Here are some of the places that you can visit on the way and in Junnar. Thane is a populous city, located 23 km from Mumbai. This beautiful city is filled with many amusement parks, perfect to spend time with your family. Sanjay Water Park and Tikuji Ni Wadi are the two parks that you can visit. The two parks have land rides like giant wheel, water activities like wave pool and rain disco. Apart from that, Thane's Upvan Lake is popular attraction for both locals and tourists. It is the main source of water for Thane which has now been converted as a recreational site as well. Dedicated to Goddess Vajreshwari, Bhiwandi is home to the popular Vajreshwari Yogini Devi Mandir. Bhiwandi is a city located 15 km from Thane. The town it is situated is now named as Vajreshwari in honour of this temple, although formerly it was known as Vadvali. About 21 hot water springs flanks the town. It is believed by the locals that these hot water springs are in fact the boiling blood of the devils slayed by Goddess Vajreshwari. Kalyan is another city of Maharashtra, located 13 km from Bhiwandi. It is famous for two important places - Kala Talao Lake and Durgadi Temple. If you visit Kala Talao in the morning, you will witness joggers around the serene lake. Locals and tourists visit the lake as an escape from the city. Durgadi Temple was built by Chhatrapathi Shivaji in order to celebrate his victory over King Adilshah, by winning Kalyan and Bhiwandi. It is a temple dedicated to Goddess Durga. 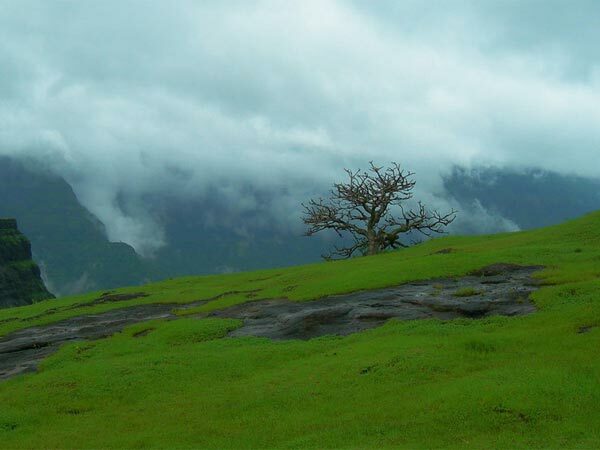 The mountain pass Malshej Ghat is a tranquil getaway, that is nestled in the Western Ghats range. Being home to many beautiful birds and undulating green landscapes, Malshej Ghat is certainly a place to visit. Trekking on the Harishchandragad Fort and bird-watching at Pimpalgaon Joga Dam are some of the things you can do on a visit to this quaint hill station. Read on to know about the places to visit in and around Junnar. Located about 29 km from Malshej Ghat and around 100 km from Pune, Lenyadri Caves is a magnificent group of 30 rock-cut Buddhist caves, found on a mountain of the Western Ghats. The word Lenyadri in fact literally translates to "mountain cave". It is situated just 7 km from Junnar. The 7th cave of these series of caves is home to a temple dedicated to Lord Ganesha. This shrine of Ganesha is one of the revered temples of Ashtavinayaka. Shivneri is a village where Chhatrapathi Shivaji Maharaj, the founder of the Maratha Dynasty was born. The Shivneri Fort belongs to the 17th century, and was one among the many citadels of the Maratha Empire. Haven for both history and adventure buffs, Shivneri is a prime tourist attraction. The Fort has 7 doors, one temple dedicated to Goddess Shivai and a huge beautiful lake called Badami Talav. The hill fort can be trekked to with the help of guides, who are usually around the foothills. Naneghat is one of the most popular spot for trekking in Maharashtra. It is a mountain pass nestled in the Western Ghats near Junnar. Inscriptions found in the ruins of the caves of Naneghat suggests that it was ruled by Satvahara and Mauryan Dynasties. Naneghat literally translates to "coin mountain pass" since toll money was collected from traders who crossed the hill, at this point. Hadsar Fort is another places that can be visited nearby.